(Nanowerk News) Researchers in Switzerland for the first time managed the detection of a protein with inorganic nanopores, opening such possibilities as drug screening on a single molecule level. The first reports on the detection of single DNA molecules using synthetic nanopores were reported by Li et al. in 2002. In contrast to DNA, which has more or less the same chemical and physical properties, various proteins could have completely different properties. For example, some proteins are highly soluble in water, others are less soluble, and in some extreme cases they are not soluble at all. Although DNA have been regularly detected using the nanopore approach, this Swiss team's report on protein detection is unique. Their paper, titled "Sensing protein molecules using nanofabricated pores" was published in the Feb. 27, 2006 online edition of Applied Physics Letters. Using the resistive pulse sensing method (Coulter principle) is one of the standard methods to size and count particles. Basically, a nanopore in a membrane is used as a mechanical constriction and a sample is flushed through, while an electronic current passing through the pore is measured. If a molecule passes the pore, the current gets temporarily blocked, which leaves a trace of the molecule in the current measurement. In their experiments the researchers used a 55nm nanopore as aperture on a 20-nm-thick silicon nitride membrane that separated an electrolyte cell into two compartments. They were able to observe current spike trains when a protein (bovine serum albumin – BSA) was added to the negatively biased compartment. The magnitude of the spikes corresponded to particles 7–9 nm in diameter, the size of a BSA molecule passing through the pore. 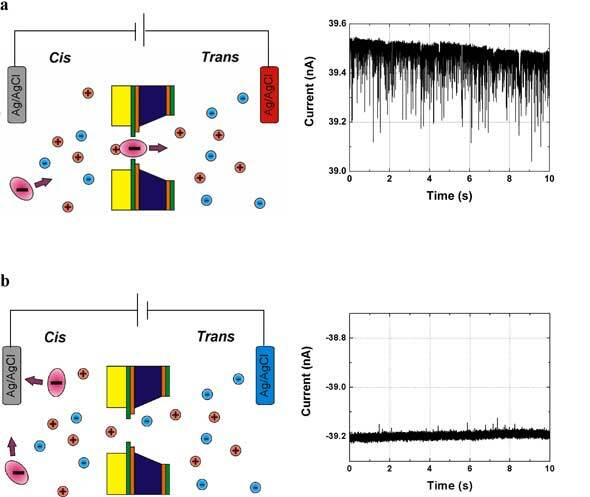 This suggests that the current spikes were current blockages caused by single BSA molecules. Urs Staufer, professor at SAMLAB, which is part of the Institute of Microtechnology at the University of Neuchatel, explained the possible future applications of nanopores used for protein detection: "There is a wide range of protein based assays in the market. One could perform immunoassays to detect e.g. hormone disturbances that are known to indicate everything from pregnancy to severe state of disease. The immunoassay market for instruments and reagents alone is 5 billion Euros per year." "A more simple and direct application would be the quality control of proteins during different stages of purification" he says. Only a few minutes are needed to count several thousands of molecules, giving a statistically relevant population data set. If the pore is fitted on top of a pipette, by the use of feedback control, single proteins could be pipetted into microtiter plates. This would enable drug screening on a single molecule level." As with all application in nanotechnology the question of fabrication cost arises naturally. "We believe that this issue is less problematic here" says Staufer. "Unlike nanopores used for DNA sequencing applications, the size of the pores used to detect proteins is not as critical. We showed that 50 nm pores were able to detect BSA." Pores with diameter above 20 nm could be achieved using electron-beam lithography, which is a standard technique. This enables the mass production of chips. At the moment the Swiss team is fabricating up to 100 chips on a 4-inch wafer. Staufer explains that with further process optimization the number of chips on a wafer could increase to a few hundred, and the total fabrication process time could be decreased down to 3 days. Since electron-beam lithography is only used to pattern a few hundred dots, the writing time could be brought down to 30 min. "Preliminary calculations show that the production cost per chip would be below 10 Euros" says Staufer. "As for the instrumentation around the chip, since our setup is in its essence a Coulter Counter that counts molecules, the mature hardware and software technology of Coulter Counters could easily be adopted" he explains. "All in all, we believe that nanopores have a bright future, research-wise as well as commercially" Staufer concludes. For more information on nanopores used for DNA and RNA probing see "Harvard Nanopore Group" and "The Nanopore Project" at UC Santa Cruz.